Stuff it with any fillings you like and you have a simple and delicious lunch. And if you make them small, individual-serving-size, you can pack them for a great school lunch. There is no end to the flavor combinations. 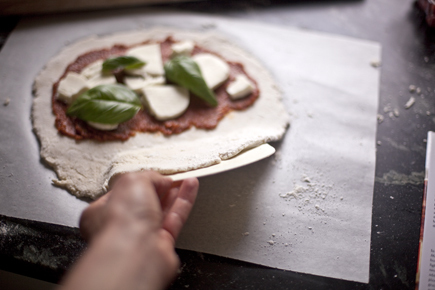 This recipe can be made with any of the doughs in our Artisan Pizza and Flatbread in Five Minutes a Day book, but today I made it with the gluten-free dough, which is super tasty and easy to work with. Because the dough doesn’t have the same gluten-full stretch, we have to handle it slightly differently, but it is just as simple as traditional dough with the right technique. 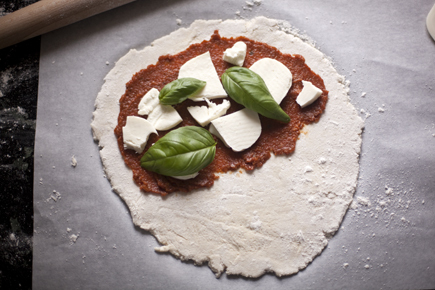 8 ounces pizza dough (about the size of an orange) from Artisan Pizza and Flatbread in Five Minutes a Day – you can divide the dough in half for individual-size portions. Preheat oven to 500°F with a Cast Iron Pizza Pan or Pizza Stone on the bottom rack. Dust a sheet of parchment with rice flour, dust the dough with flour as well. Press it into a disk. Make sure the dough is still able to move on the sheet. If it sticks, add more flour. Roll the disk out to an 1/8-inch thick circle, making sure it isn’t sticking. If a spot sticks, use a spatula or bench scraper to work flour under the stuck part. Top half the dough with the sauce, cheese and basil. Sprinkle with salt and a drizzle of olive oil. 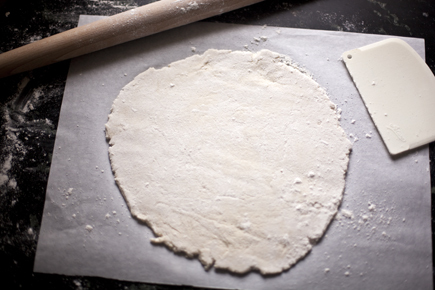 Use a Bench Scraper to lift the uncovered side of dough and fold it over the fillings. Egg wash the edge with a Pastry Brush. 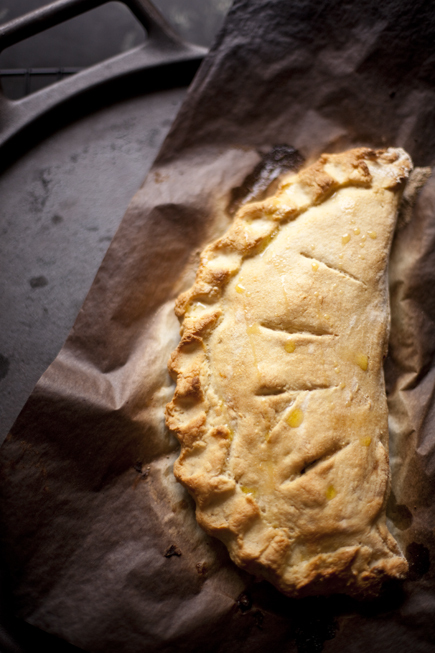 Fold the edge together to prevent the fillings from oozing out as it bakes. Brush the top with egg wash and bake for about 20 minutes or until golden brown. When it comes out of the oven drizzle with more olive oil. 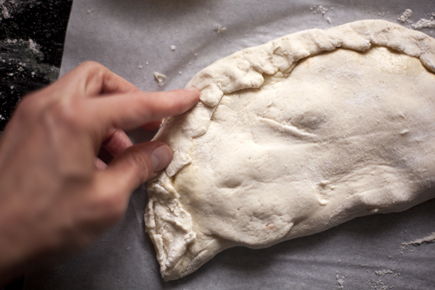 Let the calzone sit for a few minutes to allow the filling to set slightly before cutting into it. 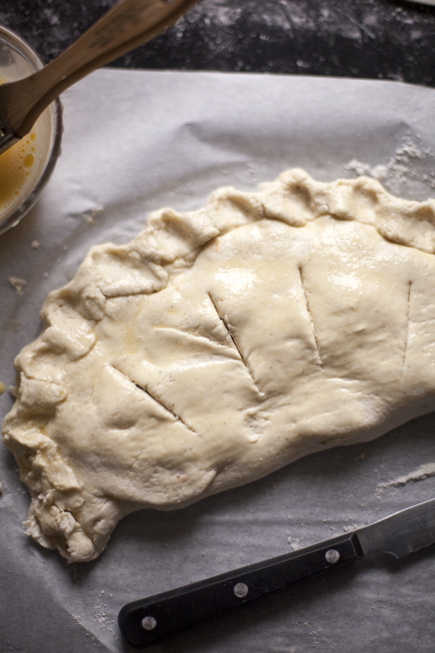 Can I use the Olive oil or crusty boule dough for the crust? My first dough from the fridge tore, saw somewhere u can just add more water to the refrigerated dough. How is this done and what should the temp of the water be if u can indeed add it after the fact. Just didn’t want to continue with this batch if it is not going to work. Which dough are you using? From which book/page number? Just work the water in with your fingers, lukewarm. Using master recipe I saw on YouTube, with you two. Have not gotten book yet but will Asa soon as I can make this work. Thanks for such a speedy reply. I look forward to mastering this. My first bread loaf has stuck profusely to the non-stick Temptations bread pan. How do I safely remove it from this “borrowed” bread pan? First off, we say to grease even Teflon before using; wet dough like ours sticks to everything. If a loaf sticks anyway, leave it in place after baking for ten min at room temp, then it often steams itself off the surface. If not, soak the whole thing in water for as long as it takes. Thank you Mr. “I told you so” Your common sense methods amaze. I use Organic Spelt flour from Pa…and get almost the same results as wheat flour. Try it and I think you will love it…an ancient grain that is having a great comeback…for your regular recipes as well as using almond flours etc for some of the other recipes. I have no problem with wheat; but, after reading that wheat is totally different after the early 1960’s i.e. a shorter stalk and mostly gmo’s if not specified organic and then still not the same grain. Where is the recipe for the gluten free dough? Thank you. Thanks so much for this recipe. I am making flatbread with my son’s kindergarten class and we have a gluten free child, so I will try this dough. When using the peasant dough recipe to make pizza, we find the pizza sticks to the peel and the pan. We oil the pan and put cornmeal on both the peal and stone. Help!!! What else can I try? 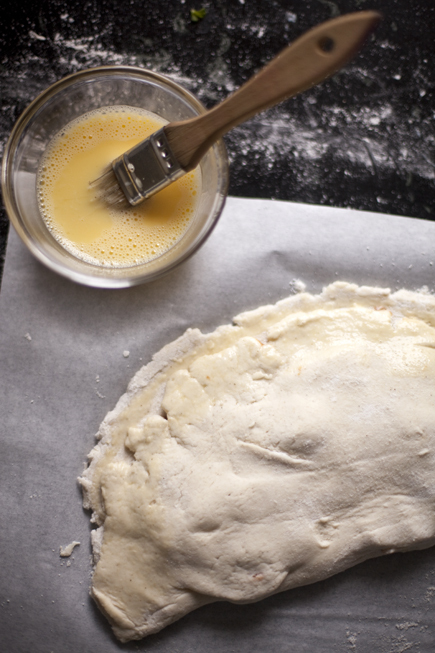 Before you place the dough onto anything, make sure its well-dusted with flour. 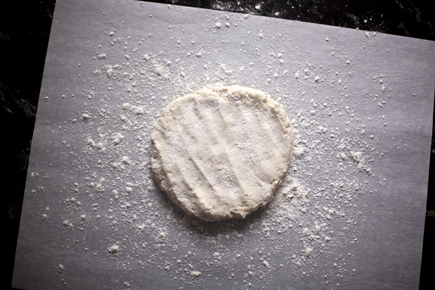 Or dry out your dough a touch if you’re still having trouble– maybe 1/8 cup more flour. I just mixed up the GF pizza dough for the first time. I like to start small when I try a new recipe, so I halved the recipe very carefully. My dough was quite moist after mixing and incorporating all of the flour. Is this normal? I know that GF doughs are often more wet than their wheat flour counterparts so I’m not terribly concerned… yet. 🙂 Thank you so much! Hey guys, thanks again for making these and showing us the way! After making the g-f olive oil dough many times over the last several months, I made a mistake with this batch: I had run out of Kosher salt so instead used table salt, and thought I had reduced accordingly, until I realized I used 2/3 tsp instead of 2/3 tbs. 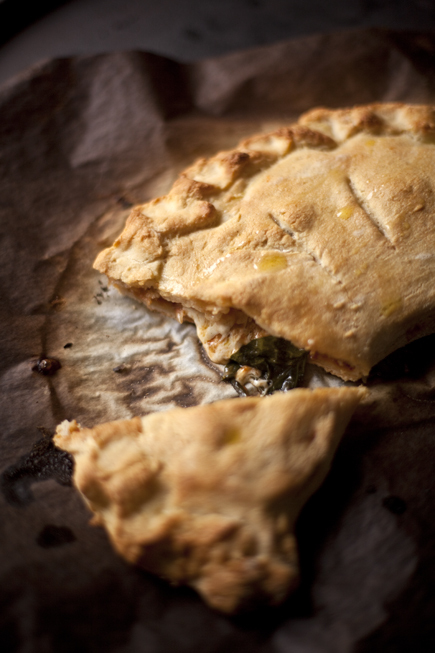 The calzones turned out beautifully, but the crust, as you can imagine, was quite bland. Is there any way I can add more salt to the remaining dough? Thanks! i’ve done it with wheat dough: make a slurry out of the remaining salt and a little water, then mix into the dough (mixer or by hand). Once it’s uniform, work in flour to bring it back to original consistency. Allow to sit at room temp to allow the new flour to ferment and re-introduce air holes into the dough. In GF dough, this may end up making everything too dense, but it might work the same as in wheat doughs. Thanks, Jeff! I’m a little hesitant because of the flour mixture — do you recommend just using one here? Maybe just the rice flour or corn starch? Otherwise I’m not sure how to build it proportionally. Otherwise I’m thinking of just sprinkling some salt over the dough before I press it out. Gluten free doughs are so testy! Sarah– probably safer to do as you suggest, but I was thinking proportional, though very approximate. Wondering if I can make the Gluten Free Crusty Boule using an egg replacement? My son has allergies. Thanks! Try it– should work, and please let us know– we haven’t done this. I have made all the HBin5 using egg replacer and they actually work awesome. Here is how I did it. I made the replacement for the head right before measuring the ingredients for the dough. I was replacing 4 eggs, so I mixed 2 flax-eggs and 2 ener-g eggs an let them set up while I mixed the rest of the ingredients. It works perfect, jus don’t use all the same type of egg replacer when you are replacing more than 2 eggs. Good luck! I’ve made that recipe with a flax egg (for the 4-loaves batch I’ve used 4 tbsp ground flax seed soaked for about 5 minutes in 2/3 cup water) as my daughter is allergic to eggs and it worked out just the same as with a “regular” egg! I love the gluten free bread recipe to bits. I was wondering if you’ve tried making ciabatta or dinner rolls out of the dough. Would love to hear feedback if you did! I’ve made buns out of the dough. Just shaped 2 oz pieces of dough, rested 45 minutes, brush with egg wash and baked at 400°F for 30 minutes or until set and brown. is this recipe ok for a person that has been directed to strictly follow plant based diet? I have a gluten free and soy allergic kiddo. Any tips on a good substitution for soy flour in the GF soy-containing recipes in your healthy bread book? Thanks! The soy flour can be substituted with any bean flours, like garbanzo or you can use sorghum flour. We added the soy to boost the protein in the bread. Can I use the GF master dough in the new cookbook for any of the regular wheat recipes in the book? My all-purpose wheat flour is Non-GMO, do I need to make adjustments to the water? It seems to be finer than regular flour. I have been making all kinds of goodies from your books. My friends and family are loving it. Next weekend I will be working with the GF Pizza dough. I know that my friend was told to avoid cast iron and stoneware that has been used in traditional baking due to cross contamination. If I bake the dough on a piece of parchment paper in either/or of my pans/stones, do you know if it would be a sufficient barrier to block any contamination? Or should I just use a new pan just for the gf stuff. Any help would be appreciated. I am not sure that is enough to protect from cross contamination? Maybe ask your friend if they are comfortable eating it? I’m in the UK and can’t find potato flour, only potato starch. Could I whizz instant potato flakes in the blender and use that in the glutenfree recipes instead of potato flour? Well, it might work! Try to get it really fine. The other option is to skip it and increase the other flours very slightly to make up the difference. I love your recipes. I was having so much trouble with GF bread, but the Crusty Bouke is fantastic and so versatile. I love that I can make it ahead and store it. It makes making homemade bread for a family doable. We have serious gluten-allergy issues in our family, and we have yet to find a GOOD French or Italian type gluten-free bread. Does your book have such a recipe? I do not have a cast iron pizza pan or stone. I’ve been making the boule with a cast iron enamel Dutch oven with good results. Would you recommend using a Dutch oven with lid on or off (or both)? Thank you! You start with it “on,” then remove it for the last third of the baking time. Which recipe are you using (which book/page number)? Thanks for your response. I am using the Master Recipe (boule) modifier for high altitude. Help! Steam or no steam for the calzone? ABi5 says to use steam, but not here. I can’t figure out which to try or how the calzone crust will be with steam. I’m leaning towards no steam….. Since this one’s egg-washed, the steam does nothing. Some of these GFs have a lot of trouble browning and the egg wash does away with that problem. Thanks! I did egg wash and no steam…although I used the master recipe from ABi5. Delicious! We loved them enough to do them again. Maybe next time we’ll try no egg wash and use steam. I liked the egg wash, but I imagine that it would be different and maybe get a more traditional pizza type crust. We are having a great time with all your recipes!